As cute as Fluffles the cat can be, there’s no question that he can be a royal pain when he curls up on or next to your warm, cozy laptop. Fortunately, the new Acer Aspire V Nitro Black Edition includes technology designed to remove cat dander and other dust. Acer launched the Aspire V Nitro notebook series on Wednesday, in both 15- and 17-inch screen sizes. Among them will be the Black Edition, sporting the flagship features that Acer hopes will set these notebooks apart from the pack. Although Acer did not announce the price or availability of the new notebooks, its partner Microsoft did: they’ll launch in Europe first during the third quarter, priced at 699 euro for the 15-inch edition and €799 for the 17-inch version.The starting price for the 15-inch Black Edition model will be €899 and the starting price for the 17-inch Black Edition model will be €999. They’re due to ship in the United States later this year. Each of the new Aspire V Nitro notebooks will ship with fourth-generation Intel Core processors, with discrete GPU options up to the Nvidia GTX860M on the Black Edition. A 2x2 802.11ac Wi-Fi provides superior wireless connectivity, the company said. 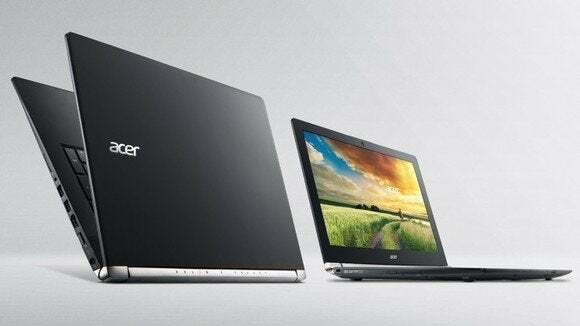 Although Acer didn’t release formal specs, these machines appear to be traditional laptops—rather than Ultrabooks—with a Blu-ray drive that supports M-Disk media that can be used to archive data for as long as 100 years. Each notebook will have an In-Plane Switching (IPS) display with resolution up to 1920x1080. Storage options will include hard drives up to 1TB or up to 256GB SSDs. Acer described these laptops exteriors as having a metal chassis, boasting what it calls "nanoimprint lithography" for a unique, textured look. Inside, the notebook keys will be backlit with by red LEDs. An 8-watt amplifier will drive four internal speakers. What else sets the Black Edition apart? Aside from a specially engraved back, all the improvements are on the inside, Acer said. These include a special metallic fan that will apparently be more efficient at carving up dust and blowing it out the notebook’s vents. The Black Edition will also include a special “turbo mode” that can be manually activated, Acer said. Revving up turbo mode enables 19-percent faster fan speed, and 11-percent lower CPU/GPU temperatures, the company said, enabling better performance. What this all will mean in terms of additional audible noise, however, is unknown. But anyone who has cracked a case open—either a notebook or desktop—is usually amazed by all the gunk that gets in there. Any technology that helps fight this should be welcomed.